Honey – a New Years Eve success story! 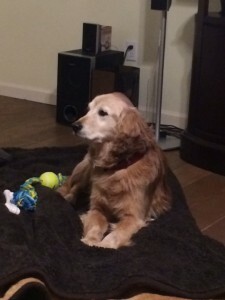 A good Samaritan called us advising that Honey wondered into her yard on 12-23-2014 without a collar. There was no reports of a lost dog matching her description. Around 5o lbs, Honey has two large tumors. One on the left side starting under the arm that runs oblong past her ribs. This one does not seem to bother her other than it is heavy and may make her off balance. More concerning is the tumor is the one on her abdomen that could be pressing on the stomach and intestines. On 12-31-2014 we had an adopter come forward to make Honey part of his family and cover all her medical care. What a great story to end the year with!